Yep. Groovy, Kinda got tagged for the ALS Icebucket Challenge. The Mighty Jon, of Everyday Abnormal fame (see the link to your right), threw down the gauntlet, so there you are. Oh, and Everyday Abnormal (see the link to your right) is a very cool comic, and Jon’s a great guy too. And you don’t need a bucket of icewater to donate to ALS research, or your Humane Society, or any number of organizations that do good. Help out all you can. It doesn’t have to be a lot. Coming up Thursday-Reade Turner like you’ve never seen her before! Nelson like you’ve never seen him before! And a pretty nifty cameo, if I do say so myself. But who do you challenge, Charlie? Who do you challenge? Can’t wait to see Reade! Whom do I challenge? I’ll tell you whom I challenge, Mr. Smart Guy! Oh wait, you’ve already been challenged. Well, you’re safe…for now. So I also challenge melaredblu and mjmassey, that’s who I challenge! So there! You don’t have to do a whole strip, but I want to see at least one of your characters icebucketed! * Unless you’ve been challenged, of course. This is too adorable for words. That’s one way to do the ice bucket!! Oh no, I’ve finally been challenged! If I had to do the challenge myself, it would’ve ended up me dumping a glass of ice on my head in my shower. Hahahaha. But if I draw something, then I’ll have to tag other people and I really don’t feel comfortable doing that. Sorry! I’ve donated the money, though. Every little bit helps. Poor Larry never saw it coming! Robie, you rascal. Yeah, I didn’t realize that part of it was challenging someone else. Too bad. I’d love to see what you would have with it. Can’t wait to see how the Assassins handle this one! And you used the whole gang! It’s great, mj! Since it’s all six, this must’ve been a pre-assasination “bonding” exercise. I like your idea better 🙂 Thank you for the challenge, Charlie! Hilarious! 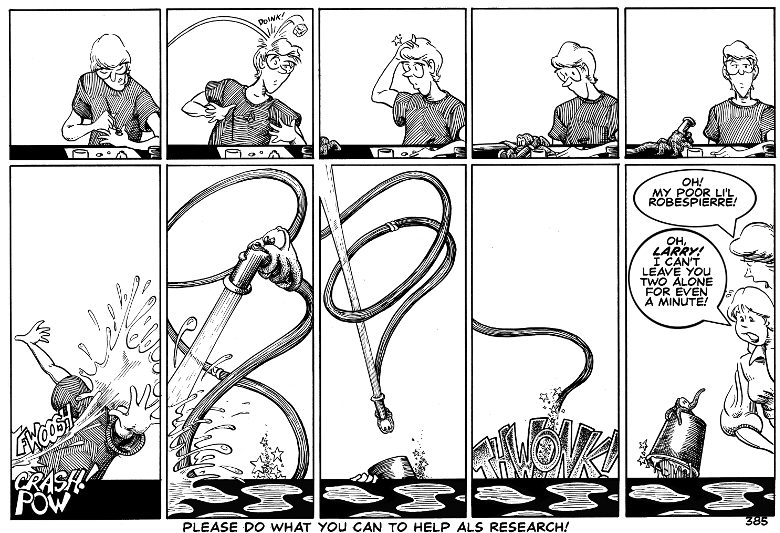 This is probably the most detailed Ice Bucket strip I’ve seen yet. And it was all inspired by the great way you did your challenge! HANG ON ONE COTTON PICKIN SECOND! Is Larry doing what I think he’s doing in panel one? Painting A Trolls and Trapdoors figure? Love this as some of my favourite people have done the Ice Bucket Challenge. I’m not as I’m still undergoing treatment for C, but I’ve donated. I was wondering when you’d notice that. Yes, Larry is painting a miniature. That one is just for you, Mike. I’m glad you like it. Thank you! Like I told Michael, this was inspired by how you and he did your challenge.